Easter Hampers from our special Easter Hamper range. Easter Sunday falls on 21st April in 2019 - make it a special one. Stand out from the crowd this Easter by moving away from the basic Easter egg gift and instead gifting a scrummy Easter hamper full of seasonal Cornish treats. At the Cornish Hamper Store we have done the leg work so you don't have to. We have scoured the width & breadth of Cornwall to bring you the best quality products. Each delicious seasonal hamper is crammed full of Cornish produce selected to be reminiscent with the season. From artisan chocolate eggs, to handmade chocolate bunnies, we have got it covered this Easter. Above all, our staff understand that gifting an Easter hamper is a special gesture With this in mind, our staff will ensure that presentation is paramount. Each hamper comes in a choice of landscape printed carton, magnetic gift box, or wicker hamper. Which ever option you choose we will carefully pack and present it to the highest standards. 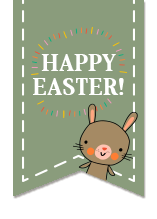 Order by 2pm Thursday 18th April for delivery before Easter Sunday.